Access to the library edition of Ancestry.co.uk is widely available at most record offices, including Worcestershire Archive, and some libraries. You are advised to book time on their computers before making a visit. 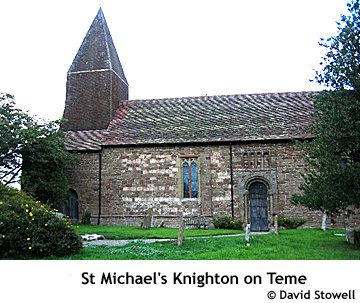 KNIGHTON upon TEAME, a chapelry in the parish of LINDRIDGE, lower division of the hundred of OSWALDSLOW but locally in the upper division of the hundred of Doddingtree, county of WORCESTER, 3¾ miles (E. N. E.) from Tenbury, containing, with Newnham, 526 inhabitants.